Ightham Mote, pronounced "Item Moat", is a superbly restored 14th century half-timbered house set in a deep wooded valley and completely surrounded by its original water-filled moat. The property dates back to 1320, although most of the building work was done in the following three centuries and then it ceased, leaving it stuck in a fascinating 16th century timewarp. 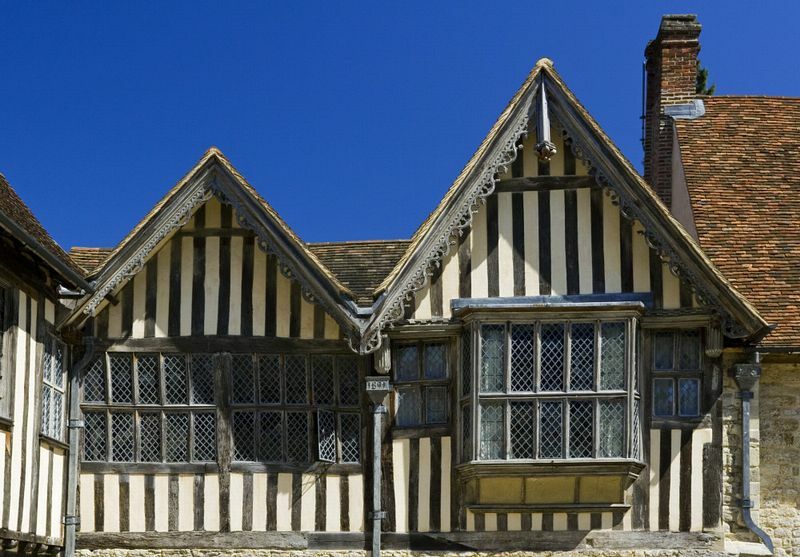 With its timbered façade and tall chimneys Ightham Mote is an idyllic historic house to visit. The manor remained unpretentious and homely as the successive owners were squires, sheriffs, members of parliament and courtiers rather than lavish entertainers. 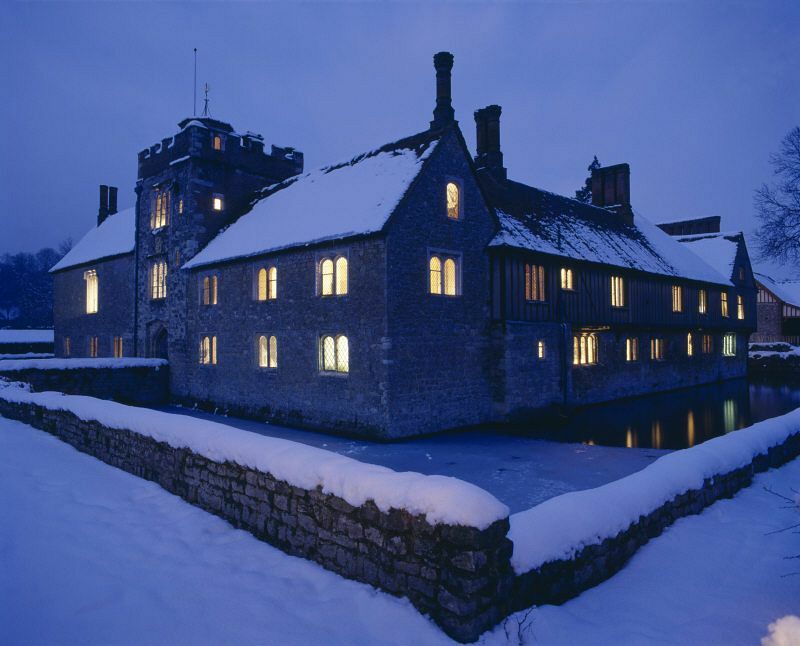 took until 2004 to complete, making this the largest restoration project ever undertaken by the National Trust. Those interested in historical renovation will delight in poring over the special exhibition detailing the project, which can be seen in the visitor reception area. Other visitors may want to move on to enjoy the features in the 20 showrooms of this charming country manor house. You should also check out the 19th century dog kennel, once the home of a St Bernard called Dido - the kennel is Grade I listed in its own right! Information sheets give the detail of each room - the drawing room with its Jacobean fireplace decorated with black and gold Saracen heads; the crypt, and the Tudor Chapel with its barrel-shaped ceiling ornately decorated. Mirrors are thoughtfully provided to avoid serious neck-craning as visitors appreciate this wonderful artwork. 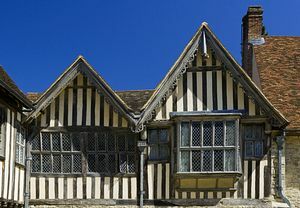 The furniture has all been acquired since the 1950s by the National Trust and although not original, it is in keeping with the origins of the medieval manor. Rose and the pomegranate icon representing Catherine of Aragon's family. The courtier, Richard Clement, who bought Ightham Mote in 1521 worked hard to show his loyalty to Henry VIII, although the king never actually visited. Other interesting detail can be seen on the ceilings and the exterior bargeboards of the house. Look for the armorial decoration of the entwined branches of the Tudor rose of England, the Fleur-de-Lis of France and the pomegranate of Granada. 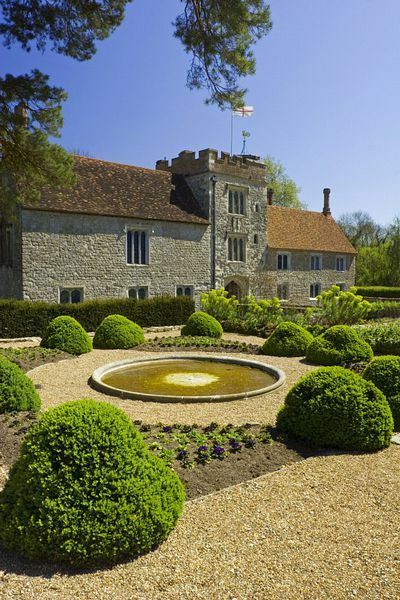 The outside of Ightham Mote is equally charming and natural. There are some interesting outbuildings, an orchard and a woodland walk. The gardens are a feast of colour with beautifully planted borders of traditional English favourites such as lilies, roses and sweet williams around the well-kept lawns. Although it has a medieval layout, the garden shows the influence of the late 19th century Arts and Crafts style. Those particularly interested in gardening may want to join a guided garden tour. The house enjoys peaceful views across the north lawn to the lake. A stream tumbles over a cascade and feeds the remains of the medieval stewpond. More water graces the fountain garden with its flagstoned paving. The day can be concluded with a visit to the Mote Restaurant and the National Trust shop where profits go to supporting the ongoing work of this worthwhile charity.